Bras with Flair on the Square is only two weeks away! I’m getting super excited! Amy Kirchen with ALK Fashion and I worked together to design my dress that I’ll be wearing to emcee the event. 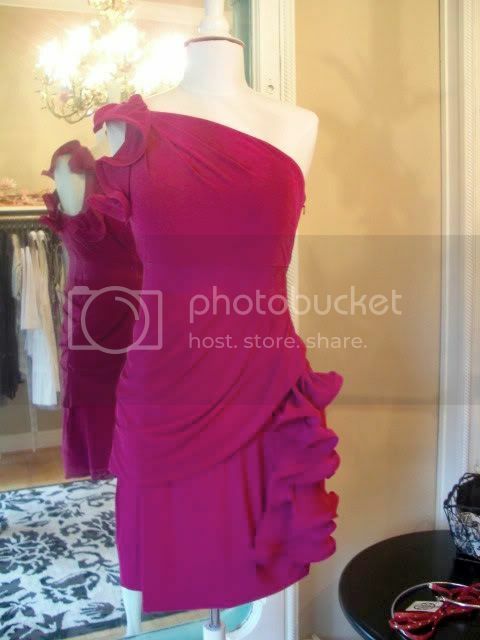 I sent her a picture of this dress for inspiration, and a few different necklines I liked better than the one shoulder. What she created was a masterpiece. It fits like a dream! I got to wear it yesterday for the first time when I went on Fox19 to promote Bras with Flair by doing a sneak peek of the fashion show. With my new dress, I wore the new Martinez Valero jeweled sandals I got at Cincy Designer Shoes‘ Closing sale a couple weeks ago. By the way, if you’re wondering about the houndstooth toes, I explain them in this blog post. I love them! But I can’t wear any brown with them, so I’m going to be kind of excited to wear all my fall colors when I get them taken off… it’s going to be a while though! The nail tech said they’ll last up to six weeks! But I digress… The dress and shoe ensemble is amazing. I can’t wait to wear it on Oct. 1 to support Susan G. Komen and breast cancer awareness with a fabulous fashion show on Fountain Square. Click here to buy your tickets (only $15 each and it includes a reusable tote bag filled with lots of great swag). 100% of proceeds go to Komen. We’ll also recognize breast cancer survivors who you nominated and voted for at the conclusion of the show, and one lucky survivor will get a complete pamper package valued at several thousand dollars. Cincy Chic and Locals on Living narrowed it down to the top five, and even though they’re all deserving, we need you to click here to vote on who you want to win the pamper package! To view the sneak peek I did yesterday on Fox19, click on the play button below! 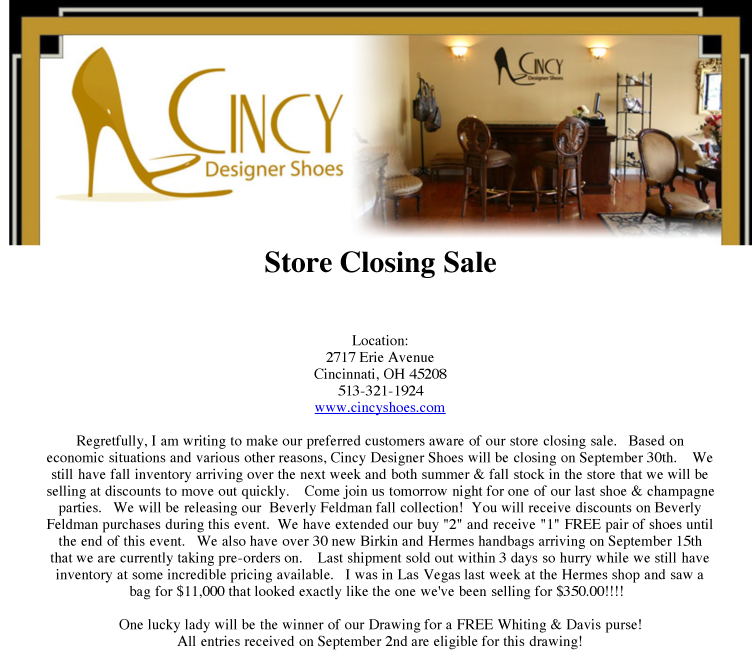 It’s a solemn Fab-u-shoe Friday today… Cincy Designer Shoes, my favorite shoe store in Cincinnati, announced that it’s closing at the end of the month (Sept. 30, 2010). 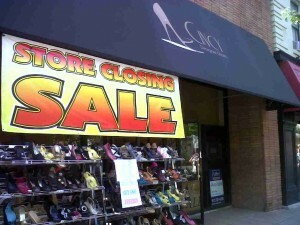 But there is a silver lining to this sad news: There are great sales on their remaining inventory! If you haven’t been in, they carry shoes (obviously), really great handbags (no one ever thinks of them for handbags, but they actually have a ton of them), tights/leggings, and shoe repair/do-dads (like foot support/comfort insoles, etc). They sent out the below email on Wednesday this week which said they’re still getting in shipments, so it’s not like their “remaining inventory” is just the bottom of the barrel picked-over stuff. 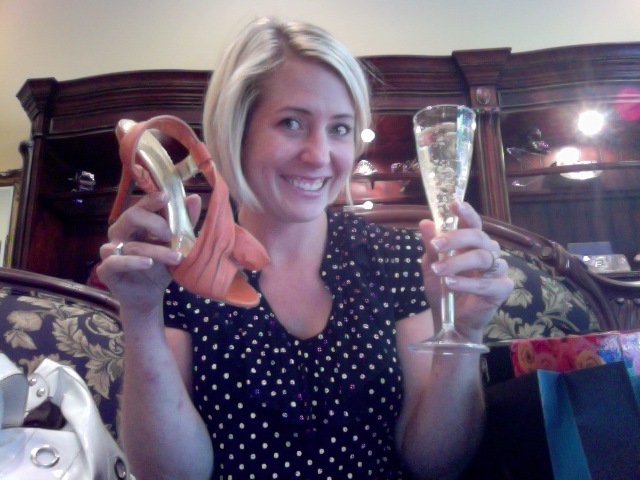 So, I went to make my final fab-u-shoe selections and take advantage of the sales. It was, admittedly, a sad experience. I talked with Carrie the owner – who we’ve written stories about and done lots of events with at Cincy Chic – and you could see the sadness in her eyes about this whole ordeal. I know personally and professionally that she’s put her everything into the store. And as a fellow entrepreneur, my heart goes out to her. But she seems to be hopeful about her future endeavors and aspirations. Before she opened the shoe store, she had an IT consulting company. She sold her stock in the company and started the store. But then the recession put a squeeze on her clients’ budgets. And then Nordstrom coming in (specializing in shoes btw) squeezed even more. It just was too much to take. So, Carrie decided to close up shop and go back to the IT world. She is also a competitive dancer (ballroom, I think). She said she hasn’t danced in so long because she’s been working at the store so much, so she lit up when I asked her if she was excited to get back to dancing… “YES!” she said! I’m looking forward to watching her start her next chapter! But this chapter isn’t officially over, yet, ladies. 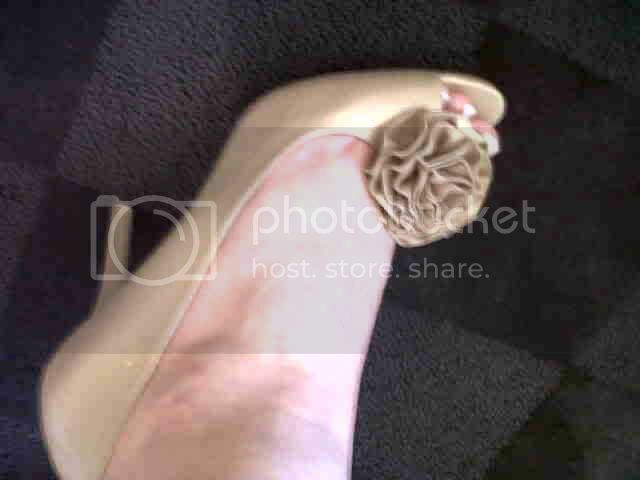 There are still shoes – DELICIOUS designer shoes – on serious sale. And if you want to treat your feet to a little taste of the good life at a deep discount, this is your chance. Because of the awesome sale, I was able to get four pairs (literally for one of the pair’s retail price). Oh and I might have gotten a big green handbag. To remind me of all the green I saved! haha! If you’re a shoeoholic (or just like good deals), I encourage you to check out the sale! For the next three weeks, I’ll blog about my other new fab-u-shoes on Friday from this fab-u-store, which I will miss very much. Please support them, and take advantage of the sales, in their last month of business! I drove through Madeira yesterday afternoon to stop in Monkee’s of Madeira, a store I wrote about months ago but just got around to visiting. Quiet little Madeira was hustling and bustling with life! Balloons out front of every store and lots of shoppers out and about. Not the norm for a random Thursday afternoon. So, I go into Monkee’s and start chatting with Liz the owner. 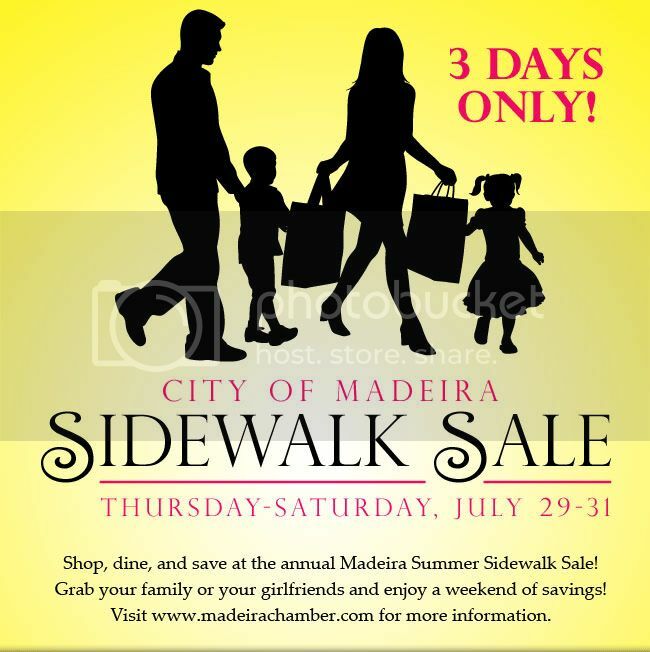 She said it’s Madeira’s Summer Sidewalk Sale this weekend. 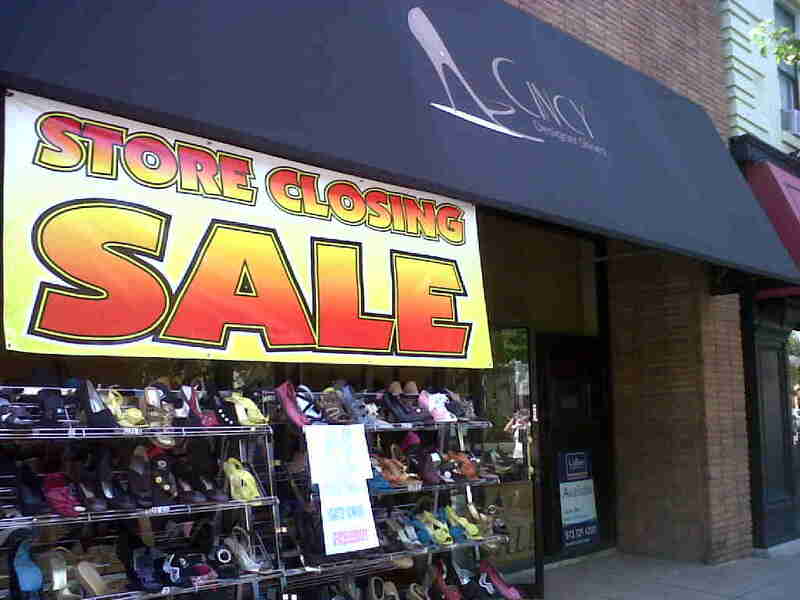 Now through Sunday, the sidewalks of Maderia will host this annual sale. Wow. Talk about a great weekend for a sidewalk sale, seriously! So, get out and enjoy the sunshine with your family or girlfriends. 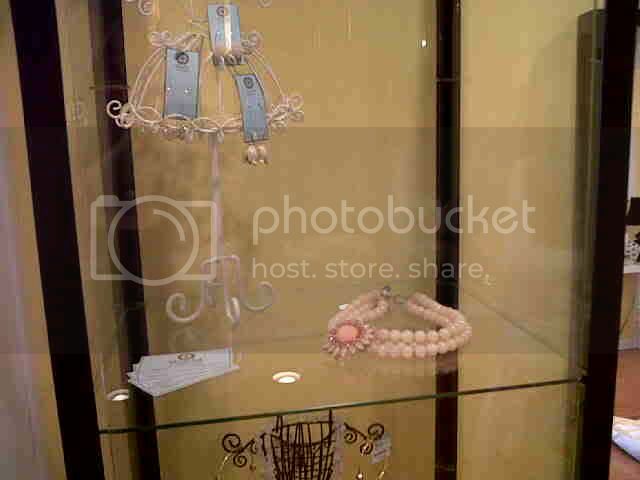 From the looks of it, sales were ranging around 50-70%. So the discounts are not too shabby – will definitely make it worth your while! For more information, visit the Madeira Chamber (www.madeirachamber.com). And just backtracking a little here… I absolutely ADORED Monkee’s of Madeira. I didn’t realize this, but apparently Monkee’s is a chain. But sort of the best kind of chain, where they are still rare enough (and Liz says her corporate is relaxed enough) to be considered pseudo-independent, but they’re big enough to get purchasing power for big name brands. I kind of fell in love with some gold peep toes, a belt and an asymmetrical gemstone necklace (pics below), but due to a variety of reasons (namely me dropping my Macbook last week and having to buy an entirely new computer… but I don’t want to talk about that right now because I might cry) I didn’t buy anything. I will be back though. Mark my Monkee-marveling words. Even if I have to bubble wrap all my expensive electronics for the rest of my life. I will be back. And I will buy things. Lots and lots of pretty things. But until then… watch and weep as I post the items I am absolutely lusting after. 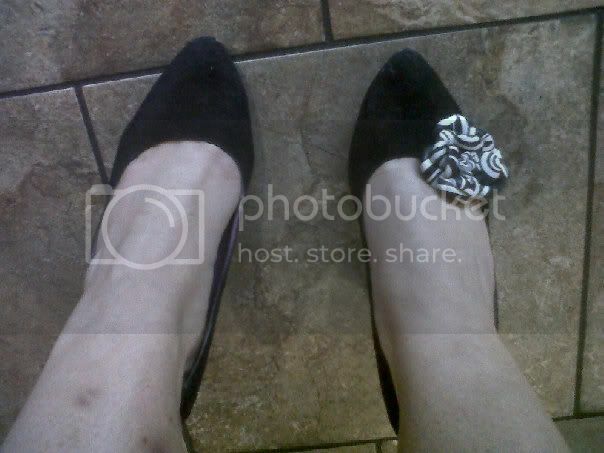 Peep toes were $149 on sale (they’re my Fabushoe Friday for today BTW! 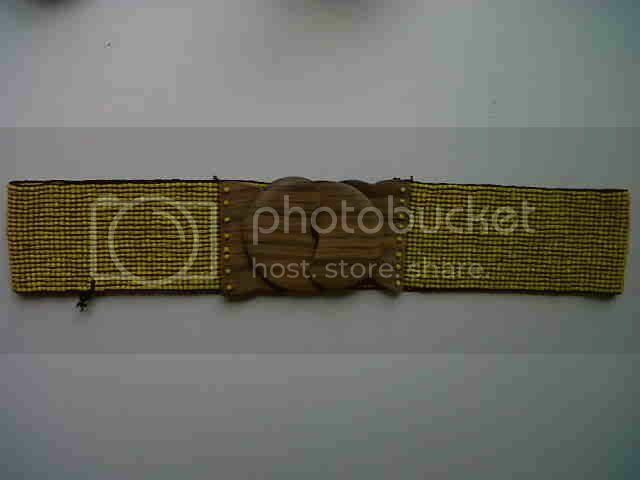 ), I didn’t check to see how much the belt was (I was too enamored with the wooden clasp… but she did say she can’t keep them on the shelves they sell so fast), and the necklace is by a local designer! Asymmetrical necklace, designed by a local lady!